New 4 Head Automatic Liquid Filler Model R-4. 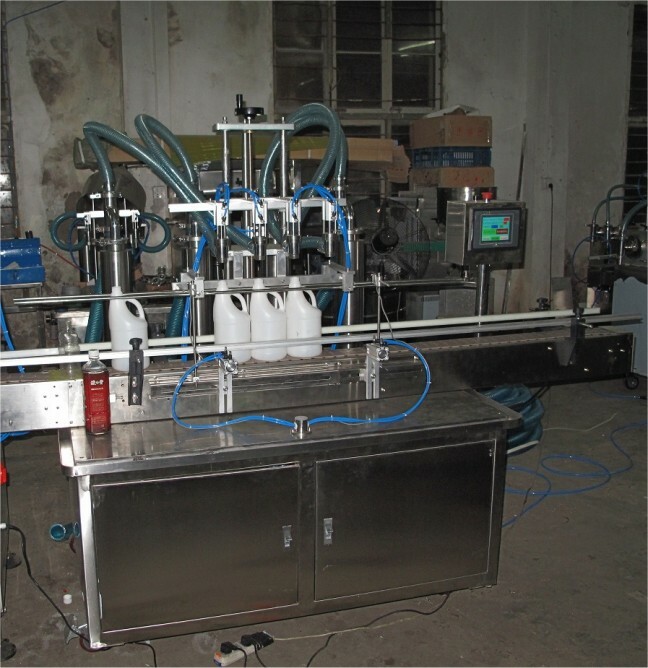 Comes with 4 filling heads and can fill from 50 – 500 ml with a filling rate of 10 – 30 bottles per minute depending on the fill size or 250 – 1000 ml with a filling rate of 10 – 30 bottles per minute depending on the fill size. Comes with PLC Controls for all machine logic functions, Autonics Photoelectric eyes used for Indexing, convenient installation for filling adjustment, no missed filling and an accurate filling dosage with counter provided. Closure heads prevent leaking with filling elevating system to prevent back fills. Nozzle spacing is fully adjustable through Top or Bottom Screw. Unit comes with an 80” Long Conveyor with a 3” Wide Belt. All contact parts are Stainless Steel, Pneumatic Controls are manufactured by Festo, Electrical elements manufactured by Schneider Electric Co. Electrics: 220Volts/1Ph/60Hz. Air Required. Delivery Time: approx 8 weeks from Receipt of 65% Deposit.